Students will understand a fraction 1/b as the quantity formed by 1 part when a whole is partitioned into b equal parts by using what they already know about the value of coins compared to the value of a dollar. Review with students by asking for volunteers to share what they remember about coins. Tell the students that today they will be dividing dollars into fractions using the coins they have just discussed. Remind students that a quarter is worth 25 cents, a half-dollar is worth 50 cents, and that the value of two quarters is equivalent, or equal to, one half-dollar. Hand out the Fraction Dollar worksheet to students. 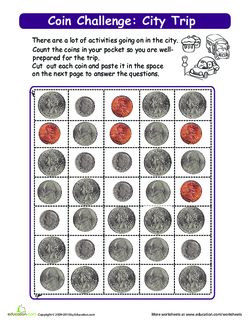 Explain that the nickel, dime, and quarter are represented below the dollar in the worksheet. Have students count together for each denomination (sequence count by 5, 10, and 25). Tell the students that the class will complete a larger example of these fractions using the sentence strips. Remind your students that the numerator is the top number in a fraction, and the denominator is the bottom number. Start with the quarter, and ask guided questions for students to work on as a whole group. Potential discussion questions include: How many quarters does it take to make a dollar? How many pieces would a dollar be divided into? What value would each unit have? If a unit is a fourth, how much would one quarter be? Have a volunteer cut out four quarters and paste them evenly on the sentence strip. Then, have that volunteer draw lines to show the ¼ pieces on the sentence strip. Repeat the same procedure for the dime (1/10th pieces) and the nickel (1/20th pieces). Explain to the students that each coin row on their worksheet is the same as one of these sentence strips. Explain that it takes four quarters to make a dollar, so a quarter is 1/4th of a dollar. Do the same with the nickel and dime. 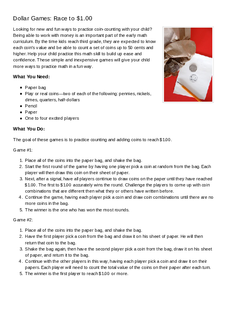 Pass out the needed materials for the Dollar Game to each group. Read the instructions to students, and have them play this game for two to three rounds. Enrichment: Give students the Enrichment Assessment. Support: Give students the Support Assessment. Have students complete the appropriate leveled Assessment Challenge. Begin a discussion about the similarities your students found with the sentence strips and what they drew. Encourage students to reflect on any changes they might want to make to their Assessment Challenges. 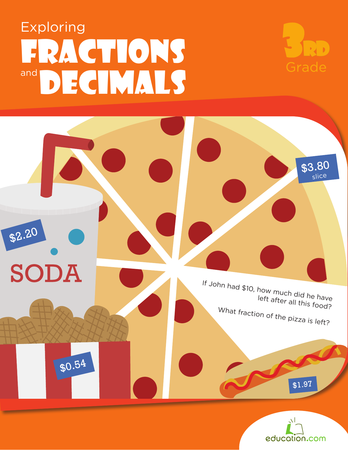 Use money to teach fractions in this engaging lesson. Eating fractions is a great way to advance kids' understanding of fractions. 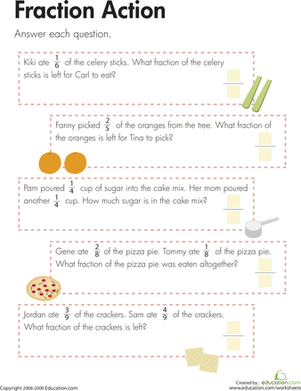 This worksheet asks kids to solve fraction word problems about food. 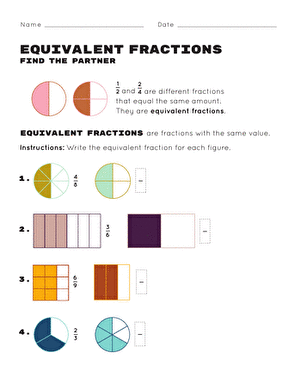 This equivalent fractions worksheet helps your child learn about and create equivalent fractions. Try this equivalent fractions worksheet with your child. This colorful worksheet brings fractions to a familiar place--the classroom--and gives your third grader a chance to convert words and ideas to fractions. Help your third grader tackle fractions with this worksheet that asks him to write the fraction that matches the shaded part of each shape. Hunting for a worksheet to help with fractions? 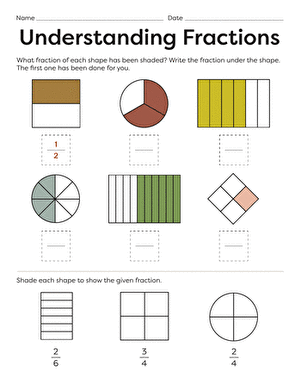 This printable uses geometry to help your child get a handle on fractions. 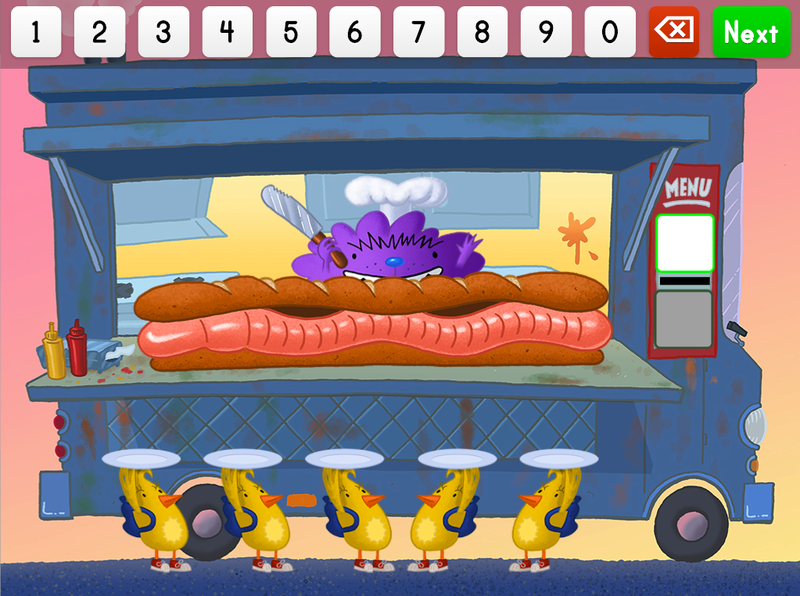 Kids identify fractions to split up wiggly worm sandwiches in this silly math game. Glossary: What Are Equivalent Fractions? 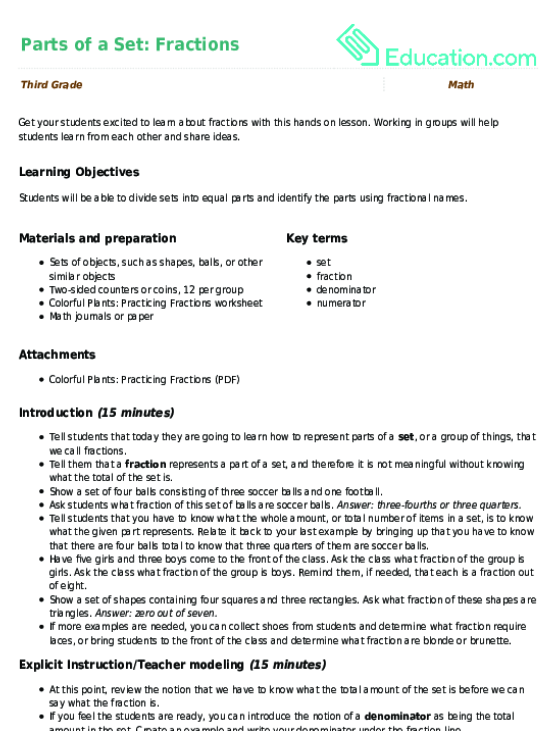 Use this glossary with the EL Support Lesson: What Are Equivalent Fractions? Show students how to use fractions to deal with parts of a whole that are irregularly partitioned with this clear exercise. 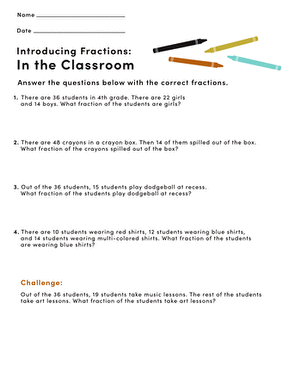 Get your students excited to learn about fractions with this hands on lesson. Working in groups will help students learn from each other and share ideas. 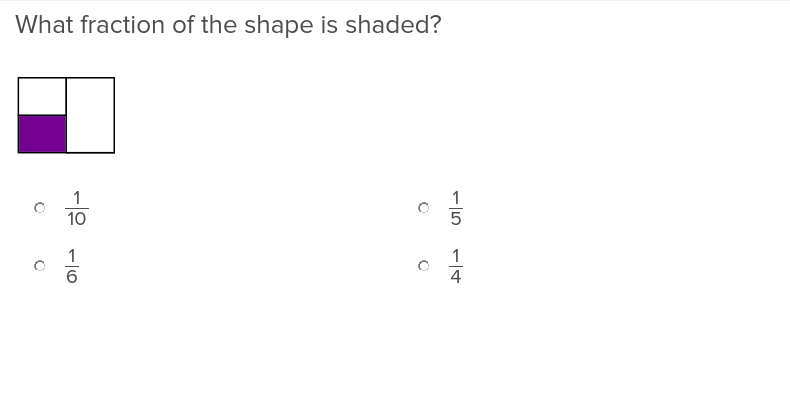 Each shape on this third grade math worksheet is divided into equal parts, and some of the parts are shaded. Kids identify and write the fraction represented.